A Chinese company is set to become a casualty of Beijing's new tariffs on US exports. China's move this week to slap tariffs on $3 billion worth of US imports, including pork products, is a blow to Virginia-based Smithfield Foods, the world's biggest pork producer. Smithfield was bought in 2013 by China's WH Group for around $5 billion in what at the time was the biggest ever foreign takeover of a US company. "There's no doubt that the new tariff regime will be a headache for WH Group," said Loren Puette, director at ChinaAg, an agricultural research firm. The Hong Kong-listed shares of WH Group (WHGLY) have plunged more than 11% since Beijing first proposed sanctioning imports of pork from the United States less than two weeks ago. On Monday, it went ahead with a 25% tariff on all pork imports. China is the third largest international market by value for American pork producers. Last year, they exported almost half a million tons of hog meat -- worth about $1.1 billion -- to the country, according to the United States Meat Export Federation, an industry group. Valerie Law, an independent analyst in Singapore who follows the WH Group's stock, said the Chinese tariffs could reduce the company's operating profits by 12% to 18%. A US-based spokesperson for Smithfield declined to comment Monday on the potential impact of the tariffs. WH Group didn't respond to a request for comment. Before the tariffs came into force, Smithfield CEO Kenneth Sullivan said he thought investors had overreacted to the news. "We export to 40 countries around the world," he said last week. While admitting that the measures "will cut into our profits," Sullivan said exports to China only made up between 5% and 7% of Smithfield's fresh pork business. Other US pork producers that are expected to be hit by the tariffs, including Tyson Foods (TSN), whose stock dropped more than 6% on Monday. A further escalation in trade tensions could make things even worse for WH Group. China said it's move this week was a response to President Donald Trump's recent tariffs on imports of steel and aluminum from China and other countries. But Trump has also announced plans for another round of tariffs targeting about $50 billion of Chinese goods in response to the alleged theft of US intellectual property. That's prompted vows from Beijing that it will hit back with measures of the same "scale" and "intensity." 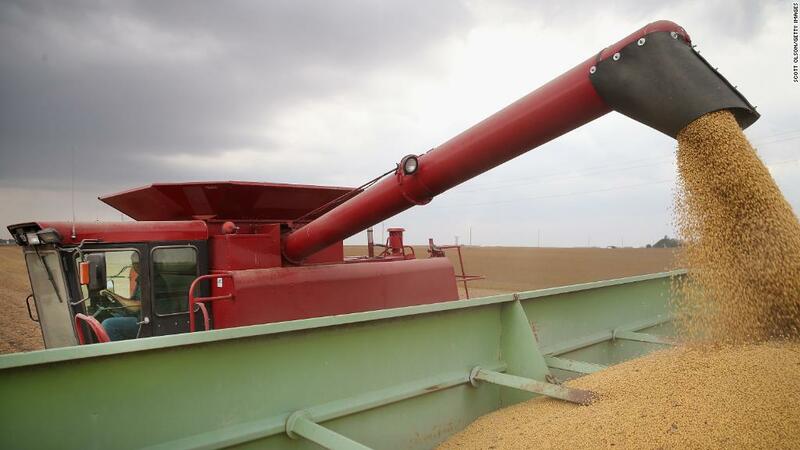 American farmers are fretting that one of China's next target could be soybeans, an important US agricultural export. But sanctioning US soybean exports would have consequences for China's food industry. "China is still heavily reliant on US soybeans to feed its pork and poultry industries," Puette said. Tariffs on soybeans would raise costs for WH Group, which also has a large pork-processing business within China itself, he said. -- CNN's Julia Horowitz contributed to this report.